Fathers and sons often share common interests. In the declining city of Detroit in 1984, Richard Wershe Sr. and Richard Wershe Jr. (RIck) share a love of firearms. In addition to being a loving, if often inept father, Richard is also a gun dealer who has some unorthodox sales methods including selling firearms from the trunk of his car and illegally selling weapons to drug dealers. While driving home from a gun show, 14 year-old Rick (Richie Merritt) asks his dad (Matthew McConaughey) “How come we stayed Dad, Detroit?. His dad replied “ Son, we’re lions and a lion doesn’t leave the Serengeti.” And for a low-level gun runner like Richard Wershe Sr, 1980’s Detroit was a kind of Serengeti. As a city declines, drugs, crime, and violence rise. Drugs are even affecting their family as Rick’s sister Dawn (Bel Powley) starts dabbling in them through her no-good boyfriend. This builds tension between father and daughter until Dawn runs away. There is however, a very strong bond between Rick and Dawn, after all they have endured, their mother walking out on all of them and the activities of their erratic, ne’er-do-well father. Powley gives a powerful performance as the volatile Dawn. Richard does have bigger dreams. He wants to open a video rental store in the dawning age of VCRs. He would even like to take his family for some frozen custard once in a while. Grandma (Piper Laurie) and Grandpa (Bruce Dern) live across the street. Rick and his father have a close relationship, but dad is a bad influence on him. Richard even enlists young Rick to make a gun delivery to a local drug dealer at his hangout. Unbeknownst to Rick, the location is being watched by a joint FBI-Detroit Police task force. He walks in with a green duffel bag with AK-47’s and custom silencers dad machined in their basement inside and walks out without the duffel bag. The task force catches up with Rick shortly thereafter and presses him into service as informant in order to protect his dad from being arrested on gun charges. Rick asks the task force what’s in it for him besides the fast food hamburger with fries they’ve bought him,and protection from prosecution for his dad. They make him an offer, he counters and is soon making buys at drug houses. Merritt plays the role of Rick with an understated, but very skilled combination of bravado, cunning, and sensitivity. Rick goes down the drug industry “rabbit hole” as he makes buys and works his way into the crew of local drug heavyweight Johnny”‘Lil Man” Curry (Jonathan Majors). He’s also befriended by gang member Rudell “Boo'”Curry ( RJ Cyler) who brings him into his social scene which is mainly centered at the roller disco. Cyler’s “Boo” is the friendly young counterweight to Majors menacing “Lil Man.” Both actors play their parts extremely well. Rick earns the “White Boy Rick” moniker from “Lil Man” for being brave enough to approach him with a deal, “Lil Man” and his crew are all African-Americans. It gets increasingly hard for Rick to juggle his different worlds and he’s dropped out of school. His undercover work leads to the arrest of most of the drug gang and the FBI releases him from his duties. He wants to go back to school, but is not allowed because he is seen as a target that could endanger other students. Rick’s life starts to twist again as he gets back into the game. The always amazing Matthew McConaughey can add another interesting role to those he’s played previously. He’s not afraid to make himself look vulnerable or unflattering in his characters and that’s one of the attributes makes him excel in this role and others. McConaughey also utilizes a wide range of emotions in this role from frenetic and angry to quiet and caring. It was also great to see Jennifer Jason Leigh as FBI Agent Snyder. She portrayed Snyder as being kind and compassionate while also manipulating Rick to get what she wanted. Her task force crew, Detective Jackson (Brian Tyree Henry) and FBI Agent Byrd (Rory Cochrane) were also good in their parts. White Boy Rick is an interesting look into a family, criminal enterprises in Detroit, and the music and fashions of the time. It’s all the more interesting because it is a true story with real life consequences. 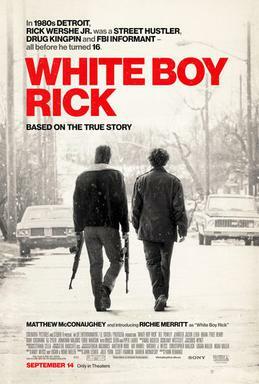 White Boy Rick movie poster courtesy of Sony Pictures releasing.